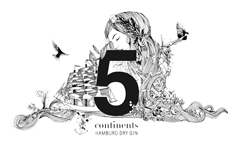 5 continents - Hamburg Dry Gin. In the Feingeisterei, our manufactory in Basthorst (near Hamburg ), Fabian Rohrwaser distills the 5 continents Gin with 22 botanicals from all five continents. It is clear, edgy and well-proportioned and contains not just its fine juniper part and balanced citrus notes but also unusual components from abroad: Its dryness from Asian ginger and cardamom seeds , sharpnes from African Paradies grains (also called Guinea pepper) and coriander, freshnes from Australian eucalyptus, softnes from American mate and cactusflowers, flowery parts from Europe with the tase of lavender and iris roots. The Windjammer lands in overseas harbour of Hamburg. Exquisite spices from 5 continents will be discharged into the venerable brick warehouse district. 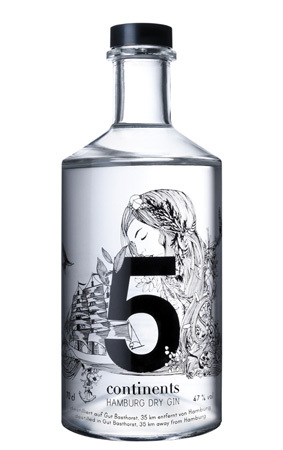 Distiller Fabian Rohrwasser distills to a gin that combines the whole diversity of its origin in itself. The style of our Hamburg Dry Gin is actually that of a "London Dry Gin", which means all the ingredients are distilled together and not mixed in retrospect. That is the method of production where the flavors of the botanicals receivs the most intimate combination with the alcohol, so to speak, the state-of-art way to distill Gin. The word "Dry" means here, that the gin is not sweetened at all. Like all our products, also our Gin is 100% certified organic.